The phrase “one man’s trash is another man’s treasure” has been the motto for online selling services such as eBay and half.com for years. Most of us have benefited from selling gear we no longer want or need online and taking advantage of the high level of exposure our product receives, as well as the avoidance of paying income tax on these sales. 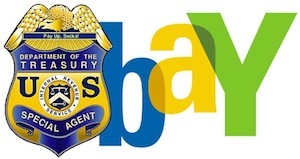 Numerous people have turned online selling into a business thanks to eBay and other services, but have not had to report this income on their taxes. than 200 transactions and $20,000 in sales per year. Before sellers get the idea to simply create multiple accounts to stay under the threshold, half.com and eBay will take all accounts into consideration when calculating the sales volume so this loophole won’t be an option. Now, most of us are not going to be in the situation of meeting either of the criteria within a calendar year, but this has some significance in online sales and retailing in general. The precedent has been set to where these sales are required to be reported to the IRS and it will become increasingly easier for the government to lower these thresholds. At 200 transactions and $20,000 there was little, if any, outrage to the rule, but now the IRS can lower these limits exponentially and the public will have little say in the matter. Will this be a prelude to the IRS requiring all online retailers to collect sales tax? This has largely been a debate on the state level and the State of California, in particular has tried and failed many time to make all online sellers, mostly Amazon, collect sales tax. And Texas has taken the unique route of saying the mere presence of a server within its state borders qualifies a company for paying them sales tax. Taxpayers are of course required to report non-taxed purchases on their state income taxes, but this is difficult to regulate. If you haven’t already been notified of the new IRS regulations by eBay and half.com you should be receiving an email shortly. We will keep an eye on the tax situations in relation to selling online, but we want your thoughts. Big deal or irrelevant to most sellers? Tell me in the comments below.